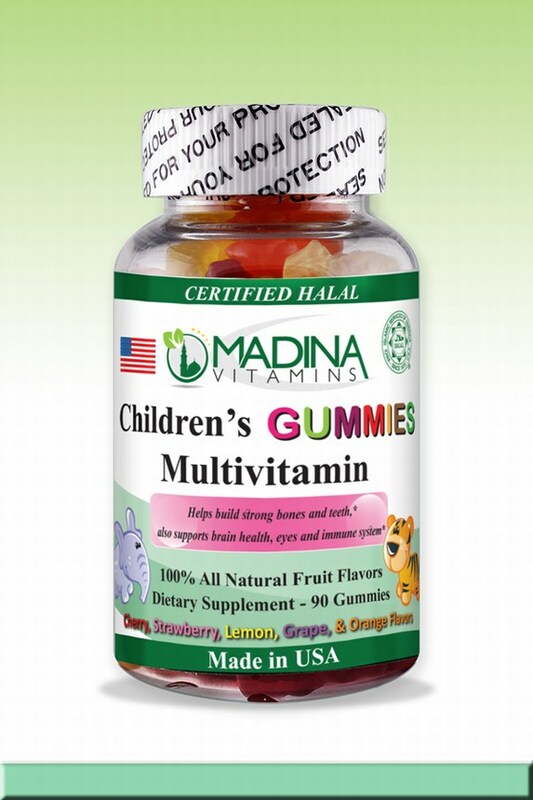 2.75" x 5" x 2.75"
Madina Halal Vitamins and Supplements are high quality halal products that do not include Pork or Alcohol based ingredients. 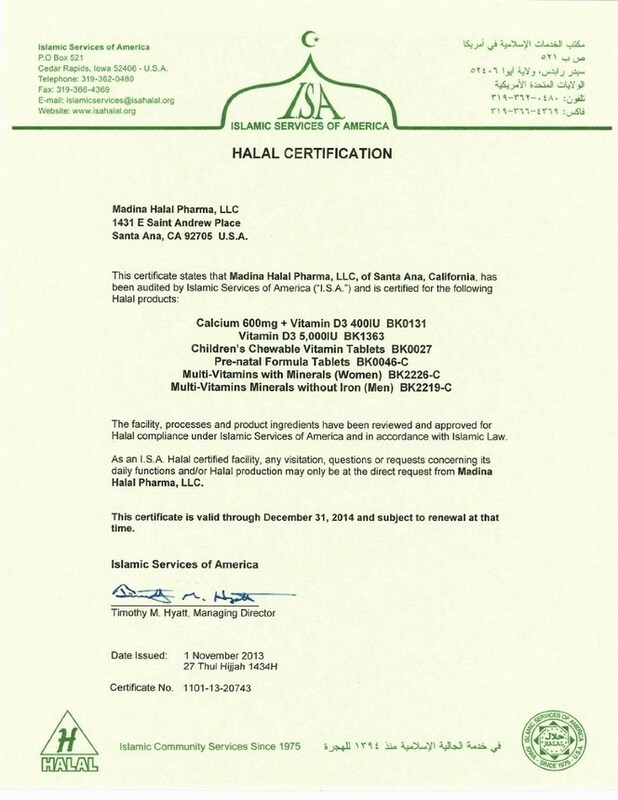 All of our Vitamins and Supplements are Halal Certified by Islamic Services of America and are manufactured in GMP Approved facility in United States of America and are approved by FDA. Children’s Age 2-3 Years: 1 Gummy per day. Children’s Age 4 and Older: 2 Gummies per day. How Children’s Multivitamin Gummies Can Help Your Child? Lets talk about Children’s Multivitamin Gummies. Is your child a handful? The answer is quite self-explanatory because children would eat anything but the right sort of food and proper diet and irritate you a lot. Mothers are always after their naughty children who find fun in teasing their parents and not consuming proper vitamins and minerals. Mothers lure their children into having proper diet so their bodies do not fall short of the required vitamins and minerals. Most luring ways are now easily understood by children as the kids nowadays are super smart. However, if you fear that your child is lagging behind in proper diet and consumption of the right sort of food then you need not to worry. 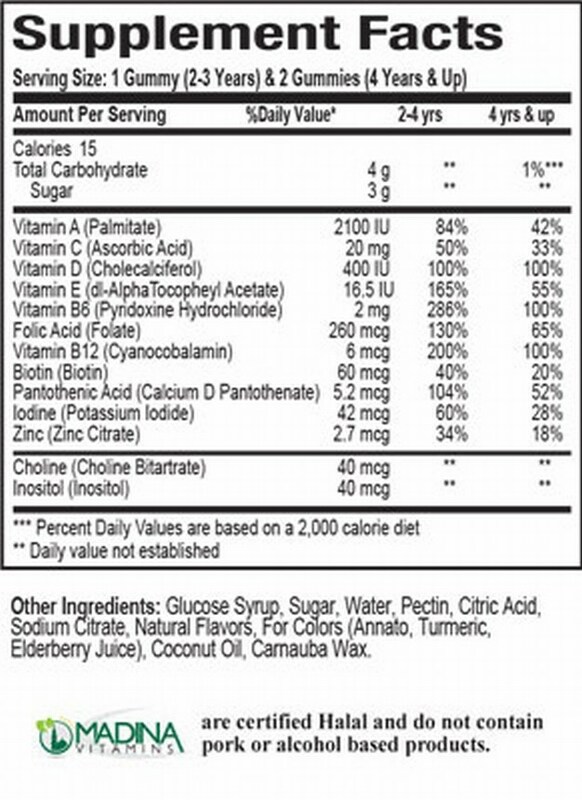 Kid’s gummies multivitamins as all the mothers would know are a popular diet and food for your kids. They love to eat maximum of them in a single go. As a smart mother what you can do is feed your children with kid’s gummies with iron and children’s multivitamin gummies so that they eat them in deception of candies. Safe is to say they are rich in multivitamins and minerals, but they do appear as candies. So your child would now no longer throw tantrums on eating his food. You can just supply him with loads of children’s multivitamin gummies with iron which suffices his or her need of the right vitamin and mineral. Vitamin C and E which improves their immunity. This is an important one since it also incorporates zinc, which is required to strengthen the immunity system of your children. These Children’s Multivitamin Gummies are designed keeping the nature and notoriousness of young children in mind. This form of food is converted into efficient body fuel when it reaches the stomach of your child. 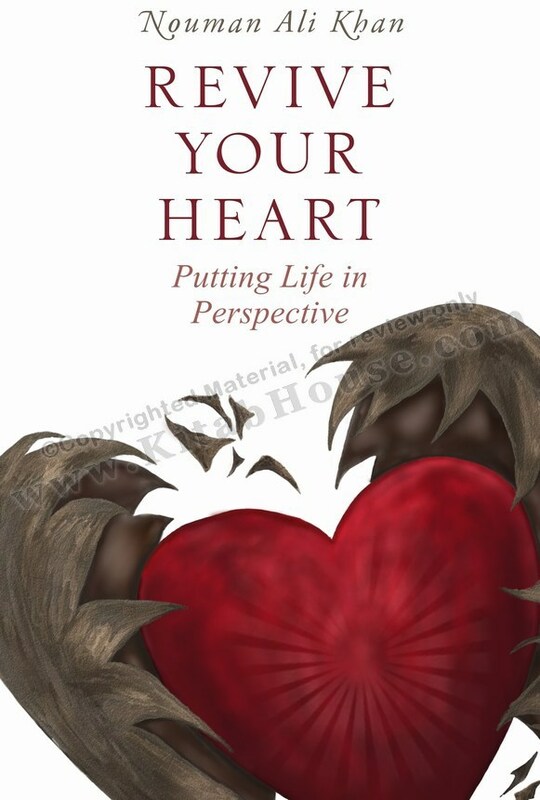 They would never know that what they had eaten is actually a vitamin and mineral source rather than just junk. This sort of deceptive food trickery is useful when children are always found near gummies and are seen sharing the love of candies. There is always a special way to treat those naughty faces through your tempting and smart ways. Many pediatricians also recommend chewable vitamins in the diet if children because often because of the taste of certain vegetables and food items children wouldn’t take a bite of them. Every child loves gummies and would consume it without a question. Children’s Multivitamin Gummies come in 100% natural flavor loaded with the right amount of nutrient that your child’s body requires. Different food brands are working into this to facilitate the everyday job of mothers. Kids by the way, love all these multivitamin gummies.